It was hard to pick just one costume to enter. We are going with the Pied Piper. 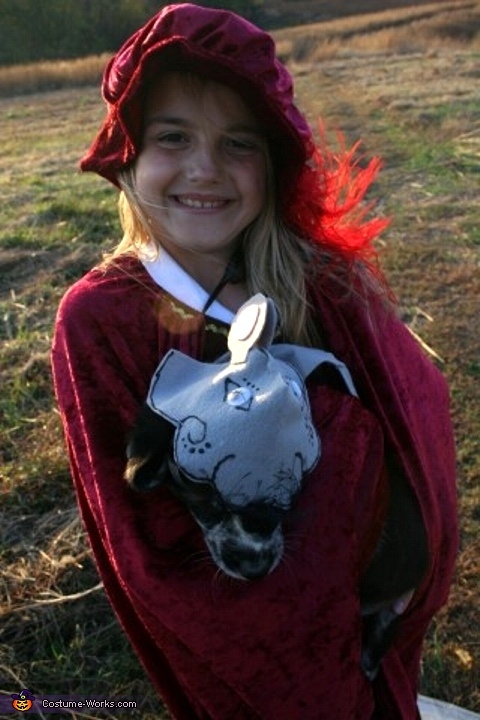 This Pied Piper (Jessica) has a friend (Cookie) dressed as a rat, and they had nine rat puppies. I don't have a good picture of all of those puppies, so I am attaching three pictures for you. The Pied Piper costume can stand alone and is an easy one to make. We used a cape from a previous costume, however you could make one. The body of the costume is a tunic, also from a previous costume, again, easy to make. She wore her favorite black boots and we made a renaissance style hat, attaching a jeweled feather to it. If you do a search you will find directions for any of the three homemade items. She used a pipe from summer camp to lure the rats. We used a box of 60 cat toy mice for the rats! These were hot-glued to a clear shower curtain. We simply folded it in half and tied it around the Piper's waist, under the tunic, with ribbon through the holes. We did have a remote controlled rat to run behind her, which greatly amused the puppy-rats! We used felt to make their masks, cutting out ears and adding details with google eyes, yarn, pom-pons and fabric paint. The bodies of the puppies were covered with a felt triangle with a tail attached. We only needed on piece of gray felt per puppy. We were looking for economical and easy since there were nine! That took one evening. Cookie's rat costume was bought on the internet. The photos show the costume in action at a local children's parade, a better view of the Piper and one of the rat faces. It was quite a hit, although I was surprised at how many children and their adults did not know the story of the Pied Piper, despite the Piper being in the recent Shrek movie.